on Streets of Vancouver, Canada! Over the last two months, the Venezuelan right-wing criminals have become increasingly active and violent in their attempt to bring chaos to Venezuela and pave the road to overthrow the democratically elected government of President Nicolas Maduro. As a result of their destruction and violence, over 70 people have been killed, over 1,000 injured and several pro-government organizers have been kidnapped, tortured and murdered in Venezuela. In their desperation, Venezuela’s right-wing has also resorted to increased violence and aggression outside of Venezuela as they attempt to provoke international intervention in Venezuela as well as to manipulate public opinion against the revolutionary government of President Nicolas Maduro. However, despite this terrorist campaign by the criminal counter-revolutionary right-wing, a majority of people in Venezuela have continued to mobilize peacefully in the streets to successfully defend the democratically elected government of Nicolas Maduro and the undisputable gains of the Bolivarian Revolution. 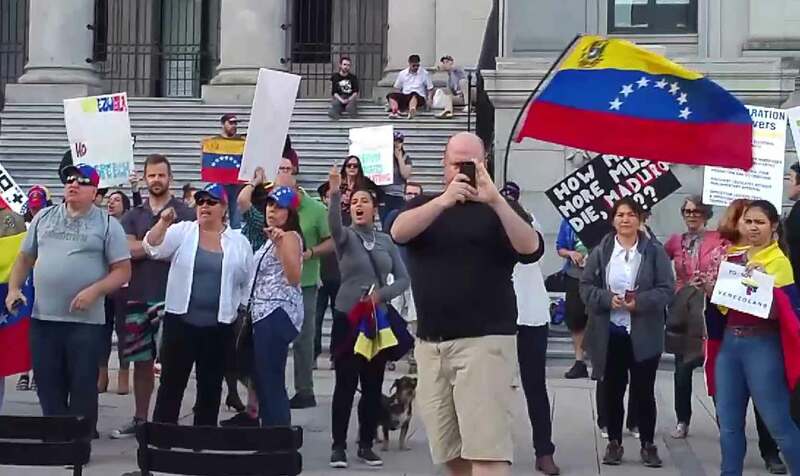 On Friday, June 2, Venezuela’s violent right-wing suffered another big decisive defeat, this time in the streets of Vancouver, Canada. 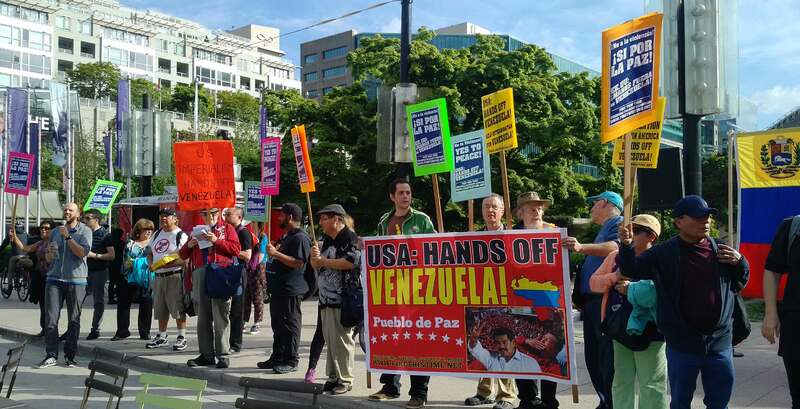 When faced with a crude and aggressive counter-protest by 150 right-wing Venezuelans, supporters of the Bolivarian revolution in Vancouver held strong at “US Hands Off Venezuela!” protest actions organized by the Fire This Time Venezuela Solidarity Campaign. 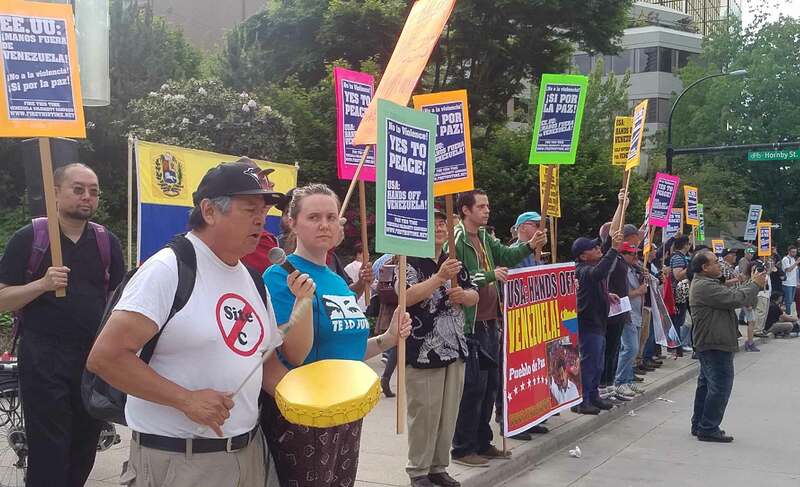 Following a successful picket at the US Consulate, and march toward Vancouver Art Gallery over 70 people maintained an energetic, loud, and peaceful demonstration in defense of the sovereignty and self-determination of Venezuela and the government of President Maduro. For over five hours, the united voices of Venezuela solidarity activists from Canada, Venezuela, El Salvador, Nicaragua, Chile, Guatemala, Mexico and other countries, backgrounds, ages and all walks of life dealt a powerful blow against Venezuela’s right-wing. Venezuela solidarity activists out on the streets that day in defense of the Bolivarian revolution included representatives from the Hugo Chavez People’s Defense Front – Southwest Chapter, the FMLN – Vancouver, FSLN, and the CPC-ML, among other groups. As the right-wing counter-revolutionaries threw rude, racist, ageist and homophobic insults and attempted to provoke violence, the pro-Bolivarian revolution demonstrators responded with united chanting of “Viva Viva Venezuela!” “Chavez Vive, Maduro Sigue!” and “US Hands Off Venezuela! No More Sanctions! No More Threats!” and filled the streets of downtown Vancouver with revolutionary Venezuelan music. The vulgarity of the right-wing Venezuelans was especially exposed by their grossly disrespectful and shameful behavior during the indigenous opening and closing to the actions. As Gordon August, a hereditary chief from Sechelt, acknowledged the unceded territories of the Coast Salish people and sang to the honour of the action, the right-wing Venezuelans continued their crude yelling, insults and their offensive gestures. On top of this disrespect and their constant provocations, the pro-US counter-revolutionaries also physically attacked supporters of the Bolivarian revolution at least seven times throughout the demonstration, including attacks against the central coordinator of the peaceful pro-Venezuelan government demonstration. In the face of this violence, Venezuela solidarity activists fought back with their voices and through a peaceful human fence block and ultimately, the right-wing counter-demonstrators, unable to impose violence, left defeated and demoralized. Although the counter-revolutionaries had more people, as they brought people from other cities of the province of British Columbia and also Calgary, a city 1,000 KM from Vancouver in the Province of Alberta, they were lacking in spirit and determination. The desperation and hatred was clear on their faces, and in sharp contrast to the determination and passion of supporters of the Bolivarian revolution. As it got dark and the right-wing counter-demonstrators began to leave, it was obvious that they were not prepared for the determined and revolutionary spirit that they faced on the streets of Vancouver. 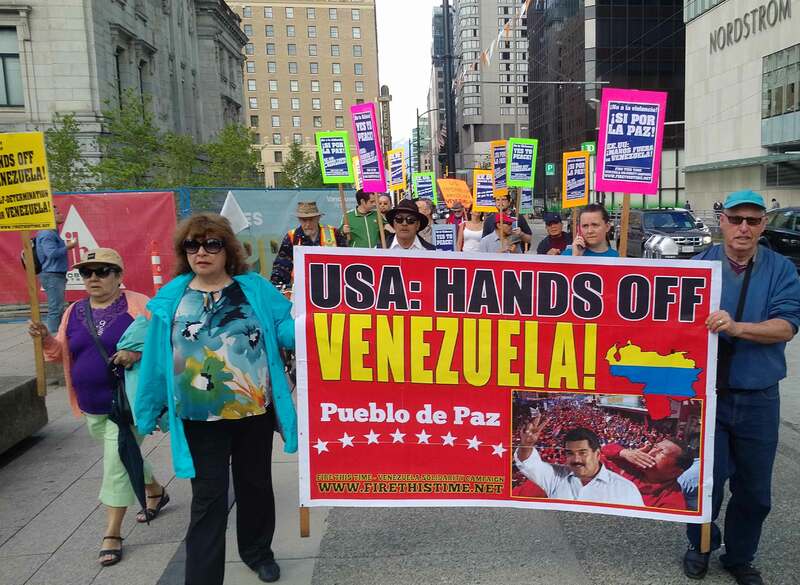 The Fire This Time Venezuela Solidarity Campaign, together with supporters of the Bolivarian revolution in Vancouver, showed that through unity in action we can win against the forces of imperialist intervention and counter-revolution! For more than a year and a half, the Fire This Time Venezuela Solidarity Campaign has organized a campaign of monthly actions in solidarity with the Bolivarian revolution. Each month, we call on people in Vancouver to come out to the streets to demand “US Hands Off Venezuela!” with a picket action at the US Consulate, followed by information tabling and petitioning at the Vancouver Art Gallery. 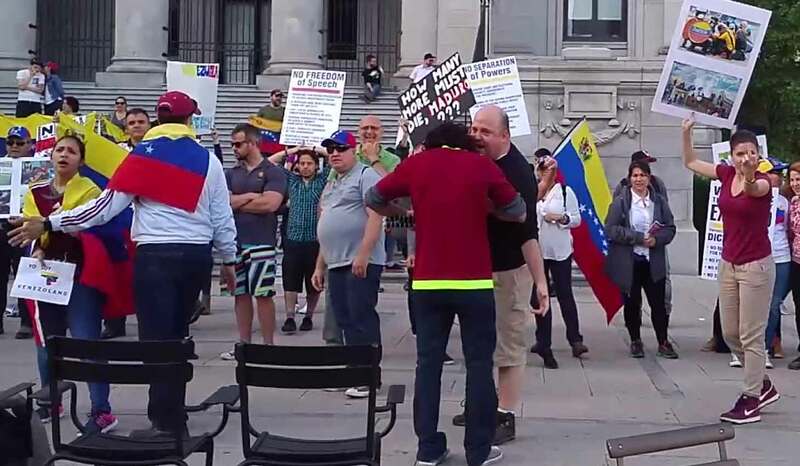 Friday, June 2 was the first time that right-wing Venezuelans in Vancouver have organized a counter-demonstration, announcing that they would disrupt a peaceful rally organized by the supporters of Venezuelan Bolivarian Revolution and the government of President Nicolas Maduro. However, as long as their criminal counterparts continue to face defeat within Venezuela, we know it will not be the last time that these aggressive provocateurs attempt to silence the voices of Venezuela solidarity activists in Vancouver and beyond. The harassment and intimidation tactics have also not stopped with the end of their aggressive and crude counter-demonstration, as they continue to spread their insults and threats after the rally and through social media. This demoralizing defeat for these goon supporters of the criminal right-wing reactionaries of the so-called opposition has indeed established that there is no place for these thugs on the streets of Vancouver and Canada. These pro-US reactionaries were astonishingly surprised by the preparation and determination of the pro-Venezuelan government demonstrators, and we are ready for more surprises if these thugs dare to continue to use violence and disrupt peaceful rallies. Defending the gains of the Bolivarian Revolution has never been more important in Venezuela and around the world! Here in Vancouver we will not be intimidated, and we will continue to defend Venezuela against US intervention and counter-revolutionary attacks. The next peaceful demonstration and rally has been scheduled for July 7, 2017 in front of the US Consulate and Vancouver Art Gallery. PRESIDENT TRUMP REPEAL THE EXECUTIVE ORDER AGAINST VENEZUELA NOW! U.S. AND CANADA RESPECT THE SOVEREIGNTY & SELF-DETERMINATION OF THE VENEZUELAN PEOPLE!